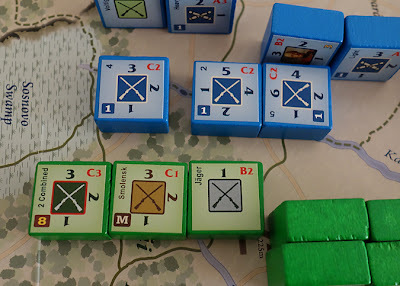 A block game from Columbia Games, covering the Shevaradino assault on 5th September, the full battle on the 7th or the multi day game running from 5th through to 7th. Lovely box art by Mark Churms. My game shipped with version 1.02 of the rules but the following AAR was played with v1.03, which can be downloaded from the Columbia Games webpage (I'm not really sure what the difference is - they don't say). Just some brief notes before we start. The blocks have their strengths indicated around the block edged. They are rotated as they take casualties. Units are activated by headquarter units. There are Corps H.Q.s and Army H.Q.s. Every time a H.Q. activates, it can put subordinate units within command range into command, but after doing that, those headquarters are rotated to the next strength down (so they get weaker). Unlike other units, H.Q.s can go as low as strength zero but at zero cannot put anything in command and also run the risk of being eliminated by losing their final step. There is an opportunity for units and H.Q.s to regain strength by drawing supply. A strength 3 Russian unit with C2 firepower. It is the 12th Division from 7th Corps. Unit quality / firepower is represented by a letter and a number, such as ‘C2’ or ‘B1’. The letter shows the sequence that combat follows, so B units always fire before C units and a B defender always fires before a B attacker. The number is the firepower number, so ‘2’ means a score of 2 or less on a D6 will score a hit. A unit rolls a number of D6 equal to it’s step strength. So a strength 3 defending unit with a firepower of C2 will roll 3 dice, looking to score 1’s and 2’s and they will roll once all ‘A’ and ‘B’ class units have made their fires but before attacking ‘C’ units fire. Set-Up. (main battle 7th September). 1) French 4th Corps (in the area of Borodino village) starting to move around the Russian long flank to seek river crossings and help pin the Russian flank. 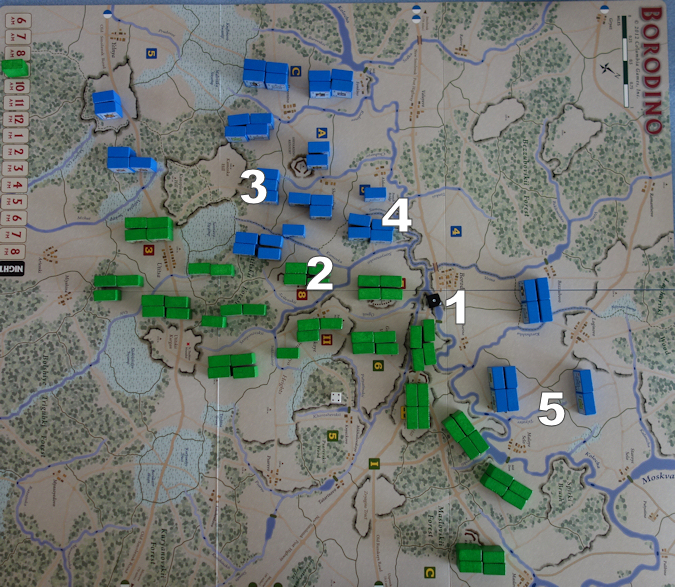 2) The right French flank is initially quite weak, it will move up, but hold back from assaulting. 3) These two French stacks ford the stream and assault Utitskii woods (the left hand Russian stack). 4) 5th Corps move forward to act as an immediate reserve. Their H.Q. only has a strength of 1, so is both vulnerable and constantly needs supply to keep it going. 5) Ney’s 3rd Corps, moves forward into assault positions to attack the Great Redoubt. 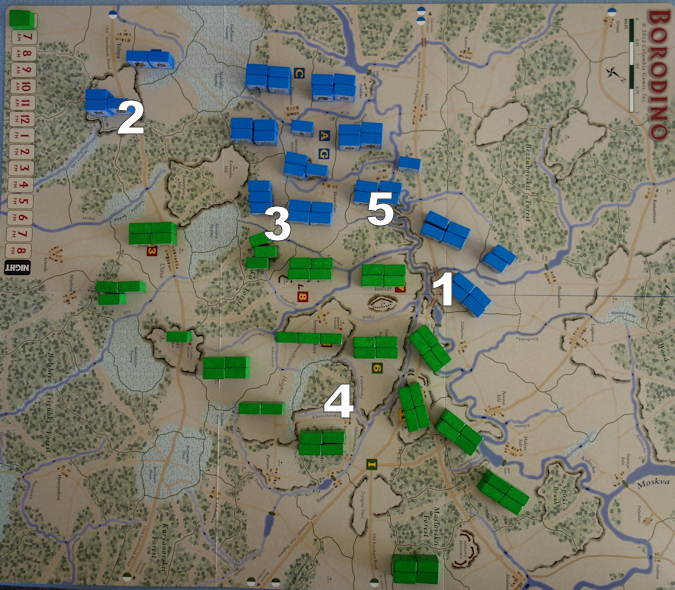 Each turn, both sides dice for initiative, except on turn 1, which always goes to the French. Command Phase (French). The 4th, 3rd, 1st and 5th Corps are put into command by selecting the formations respective H.Q.’s. Bombardment Phase (French). ‘in command’ artillery can bombard adjacent areas, but then the bombarding units will not be able to move in the next phase. (Example of bombarding fire). The light artillery of 1st Corps have 3 steps (so will use 3 dice) and hit on 1’s and 2’s. They fire at the Russian 8th Corps, who are defending at Les Fleches. Redoubts do not get their usual defensive benefit when defending against artillery fire. The 3 dice are rolled, giving 1 hit. The Russians take in on the 27th Infantry Division, which drops from a 3 step unit to a 2 step by rotating the block. Movement Phase (French). Both French flanks move. On their right they push out with forces that are too light to take up any serious fighting without additional help. On their left, they have sacrificed the chance to use their artillery this turn to make sure that all of 4th Corps can move further along the river, so that they have more crossing points from which to launch an assault and to pin the Russian right flank. 1st Corps are the only formation to attack and they do so from two adjacent areas, crossing a stream at fords and attacking into Utitskii, a wooded area next to Les Fleches. Woods allow stacking of three per side, so the French advance with 3 good units. This attack will not be resolved until after the Russians have taken their part of the turn. 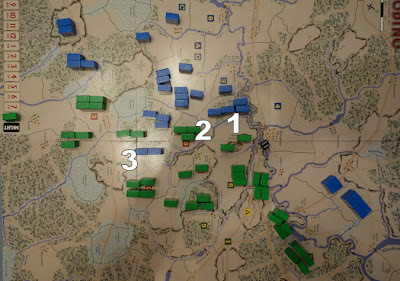 The Russians will not be able to reinforce the area because they already have 3 units there (so they are fully stacked) and they will not be able to withdraw any units because the three French units pin an equal number of enemy units (i.e. all three Russian units). At the end of the movement phase, all activated H.Q. units are de-activated, but they must each lose 1 step in the process. This degrading of H.Q.’s can really matter later in the game, especially for the Russians as generally their H.Q.’s have fewer steps than their French counterparts, so have trouble sustaining operation as there is never enough supply to go around (supply re-builds steps). Russian part of the turn. Command Phase (Russian) - 1st, 5th and Golitsyn H.Q.’s activate. Bombardment Phase (Russian) - 1st Corps (defending across the river from Borodino) have a couple of decent strength artillery units. You can only bombard across each one boundary once per turn and by only one unit, but these Russian guns have two boundaries facing the French, so both artillery units can fire. They get 1 hit against Borodino and two against the adjacent area, that was well worth doing (the Russian artillery along this river remained dangerous throughout the game). 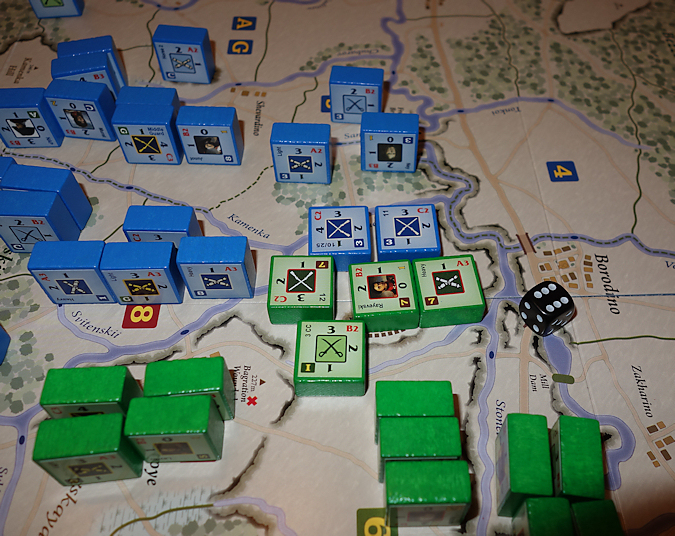 Movement Phase (Russians) - Golitsyn moves his formation onto the main road (left flank) and pushes jagers into the woods near to where the French are attacking as a backstop. 5th Corps have a weak H.Q. but they are a useful reserve, they move towards Semgonovskaya Heights to become a central reserve. The Russian H.Q.’s are now de-activated and they each lose a step. This causes the 5th Corps H.Q. to reduce from 1 to zero, making them vulnerable to being eliminated and also meaning they cannot activate again until their strength is re-built by gaining a supply point. Battle Phase (both sides) - Battles can last for up to 3 rounds and then if not resolved by the 4th round, the attackers must retreat, taking pursuit fire as they do. Units fire in the order of their firepower rating. 1 militia and 1 jager, together with 1 infantry unit from 8th Corps. There are no ‘A’ class units in this action, so go straight to ‘B’ class, there is one, the Russian jagers. They get to roll 1 die and need a 1 or 2, but they miss. Next ‘C’ class units fire and it just so happens that all remaining units are ‘C’ class. Defenders always fire first within each class. The Russians get 3 dice for one unit, needing 1, 2 or 3 to hit (C3) and the other unit also gets 3 dice but can only hit on 1’s (C1). They are unlucky and score just 1 hit. Each loss is always taken on the strongest enemy unit at the time of application. In this case, that is the French 2nd Division, which drops from strength 5 to 4 by rotating the block. All three French units hit back on 1’s and 2’s and they get 11 dice between them. This results in 3 hits - ouch! Round 2 (of 3 rounds). It is pretty obvious that if the Russians stand, they will be crushed, so instead of firing, they will retreat. The jager B2 unit activates first and falls back. Next ‘C’ class units can act and since defenders go first, this allows the remaining two Russian units to slip away. The French are left without a target, but they keep the area, which is a useful position. They could re-group and move into an adjacent friendly or vacant area, but where they are currently located suits them fine. Supply Phase (both sides) - Each side has 4 supply areas on the map edge, each providing 1 supply point per turn. Each supply point can increase the strength of any unit or H.Q. by one step, but any single area cannot receive more than 1 supply point per turn. The French decide to re-build all of their H.Q.’s back to full strength and the Russians build up 3 H.Q.’s and one of the units from the earlier battle. Bridge Blowing (both sides) - each player can attempt to blow one bridge per turn. The Russians attempt to blow the bridge at Borodino and succeed (50 - 50 chance). This immediately helps reduce the threat of the French 4th Corps forcing a crossing, who had spent their part of the move getting into position to launch attacks across two bridges and now one of those bridges has been denied them. Turn 2 - With the sequence of play fully explained, the rest of this AAR will briefly go over the action between turns 2 to 15. Both sides roll 2xD6, it is a draw, so the French get the initiative and go first this turn. The French want to reduce the units in the redoubt by using bombardment before they attack (redoubts do not have a defensive value against artillery), but delay allows the Russians to slowly shuffle some units around and to use their guns to good effect. The loss of the bridge at Borodino has really hampered the French 4th Corps, as they now only have one crossing point and that is against an uphill position, so only one unit at a time can cross that border to enter that area. The Russian guns on the heights are really hurting 4th Corps. Turn 3 - The Russians get the initiative. They only activate two leaders, so that they can fire artillery and then come the supply phase, they can build up other units instead of the H.Q. units absorbing all the supply (as they typically do). French 4th Corps move to break contact, drifting further northwards as they do that. In the centre, French infantry advance from Utitskii, further into the woods, to face light troops, but they take a terrible mauling. 2nd Division is eliminated and 5th Division is reduced to 1 step and retreats. 1/ The town of Borodino and the blown bridge. 2/ Les Fleches (a redoubt next to the Great Redoubt). 4/ Ney, facing the Great Redoubt. 5/ 4th Corps moving northwards to find a suitable place to fight across the Kolocha River and break into the Russian rear and / or threaten their supply. Concentrated French artillery fires against Les Fleches and causes havoc. The French take the opportunity to launch an attack. This will be tough as each hit on the redoubt (from non artillery) only counts as a half hit. The three defenders in round 1 only have 1 step each. The 3 step cavalry unit will arrive in round 2. As the infantry attack goes in, Russian II Corps push their light cavalry into Les Fleches to support the defenders, they will arrive in round 2 of battle, while their heavy artillery fires into the contested area. This carries some risks as any 6 rolled causes a loss to their own troops. The Russians still hold the Fleches as round 4 of combat starts, this means that the attackers must retreat and that they take pursuit fire while doing so. The French should really have used the bayonet charge rule to maximise their chances - forgot to do that! Turn 5 - Napoleon activates. As an Army commander, he can activate units from different formations. He uses this ability to start to co-ordinate artillery fire from different formations against Les Fleches. At Maloye Selo, 4th Corps attempt to cross the Kolocha to attack 2nd Corps and succeed. Turn 6 - The Russians counter attack against the 4th Corps on the Kolocha and eliminate both French divisions. Turn 8 - This is a halfway point in the scenario. So far the French have lost 4 blocks and the Russians 12. 1/ The French have captured Les Fleches. Their H.Q.’s are in need of having their steps re-built due to all the activity of the morning. 2/ French 4th Corps have twice been ejected from their foothold on the other side of the Kolocha and their losses are heavy Each turn, they are taking 2 valuable points of supply to rebuild a unit plus the H.Q to keep them in action, so this flank attack is hampering the French drive in the centre. 3/ The Russians have little real strength in the central area. 4/ This is the area of Utitskii woods, held for some time just by Jagers and some militia. Turn 9 - A devastating result for the French as they try to force the centre and lose two divisions plus Davout's H.Q. (from 1st Corps) in the process. Turn 11 - Keeping the pressure up and trying to break the centre, the Old Guard and Guard cavalry push through Utitskii, deeper into the woods and finally clear those jagers out, however, the French are getting weaker and the Guard have been played rather too early really and are too far forward.....in the wrong place! 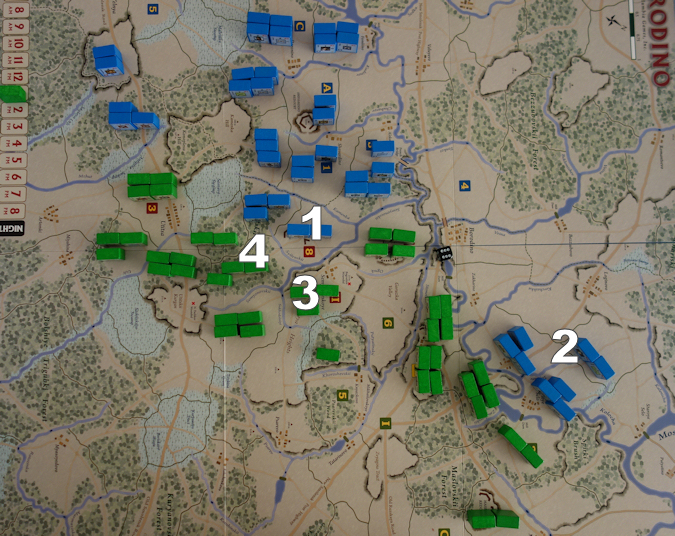 Turn 12 - French 4th Corps disengage, their losses caused by artillery are really starting to tell. Turn 13 - Ney continues his efforts in trying to soften up the Great redoubt with bombardment, but to no avail. 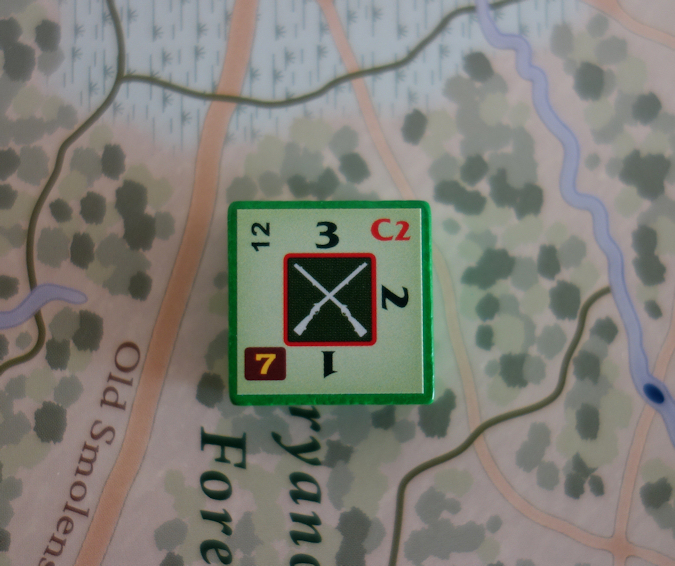 Turn 14 (7 pm) - Ney, supported by artillery from Les Fleches, bombards the Great Redoubt and follows up with a bayonet charge (this increases the attackers firepower value by +1 but any sixes rolled cause casualties to their own forces). 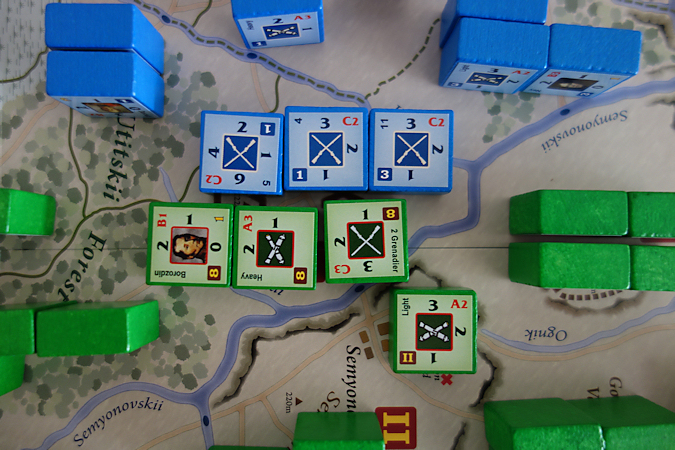 Kutusov (Army Commander) sends cavalry into the Great Redoubt to support the defenders. The Russians lose a unit, but the French divisions are both reduced down to single step strengths and so retreat.... time is running out. Turn 15 (8pm, last turn) - The French win the initiative. They activate to concentrate bombardment on the Great Redoubt, with the intention of making a follow up assault. However, the bombardment fails and casualties would be too high and pointless to follow up with an assault. 1/ Ney’s failed attacks into the Great Redoubt. 2/ The Russian re-capture Les Fleches. 3/ The Old Guard and Guard cavalry find themselves deeper in Utitskii woods. The Russians lost 17 blocks, the French 16. The French losses included guard units and a leader, while failure to capture the redoubts also went against them. In the end, the VP scores are 45 to the Russians and 19 to the French. A clear Russian win. Mistakes - The few I have noted are that in some retreats, I forgot to note the border limits for movement, not sure if that mattered, but it was only a re-read of the rules that brought it back to my attention. I also allowed artillery to move into woods (at Utitskii) which is not allowed and I mostly forgot to apply the combat modifiers to artillery when firing up or down slopes (that mistake probably favoured the French). 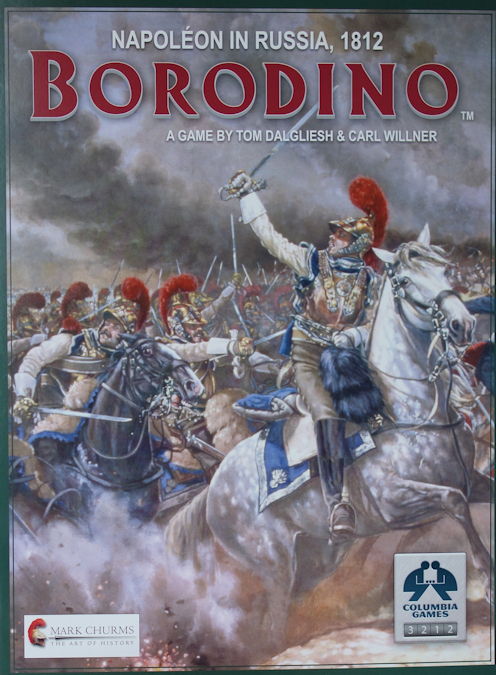 Borodino was a bloody frontal assault, without much opportunity for manoeuvre or finesse and of course, so it is in this scenario with a congested battlefield and difficult terrain. The Columbia block engine once again manages to come to a new period and produce a very likeable game. The map is lovely and it’s nuances really keep the system fresh and gives an individual feel to the game. This game also gives a scenario for fighting on the 5th plus the three day battle for the 5th, 6th and 7th period, so there is a chance to explore some wider opportunities. Les Fleches become something of a grinder and occupying it for either side can be a curse as artillery causes such carnage. The constricted terrain makes it hard for the French to get all of their forces into action easily, so pushing beyond the Fleches is tough. The rules are concise, which is generally for the good, but sometimes, you feel a few extra words here and there would have helped, though things can be reasonably worked out for yourself. I do like the way the command rules force formations to stay together and act like formations and that they also become exhausted by formation and can need rotating out of the line, so reserves have a proper function. I did not really get much chance to use squares, on the one occasion I thought about it, Cossacks were involved and it seemed better for the French to retain firepower by not going into square and seeing the Cossacks off .... though that plan didn’t work! A game of this price should really have a terrain key that identifies the various terrain icons. It's absence leads to some searching and again it can all be worked out, but the company going the extra mile on this point would have been appreciated by this gamer. Overall, this is a game that I am happy to have in my collection and I can see it getting a fair bit of play as I explore how best to use both armies and also take advantage of the 3 day battle to see whether the battle might develop in other ways (I will post back on that when done). Solitaire - This is a two player block game, but I played the above replay solitaire and it was fine. Probably the bit of fog of war that is missed is that in a two player game, you would have to gauge when to launch an assault after bombardment, without knowing the real strengths that await your attack. But other than that, solitaire is fine and there are no cards to handle. Size - this has a six panel heavy card map, the two order of battle cards are only used for set-up, so the game only needs a small table, just for the map. There are just over 100 wooden blocks on the map at the outset. Four dice come with the game. Complexity - For those who have played other Columbia games, this cousin has the usual mechanics of their (cardless) block games, so things are quite straight forward, you just need to learn the unique bits that give the game the historical flavour. Probably the best way is to download the rules, so that you can write on them and highlight those small things that can be easily lost or forgotten. If you have never played one of these games, then complexity may be above 4 out of 10 for your first game, which will be a learning exercise. For everyone else, complexity is in the range of around 3. Time - The box says 2 - 4 hours. I have only played the 7th September scenario and that took just over three hours, though I was writing the above account, so the above time suggestion seems about right.